Its tangy taste and creamy texture make Greek yogurt an appealing option to yogurt enthusiasts. 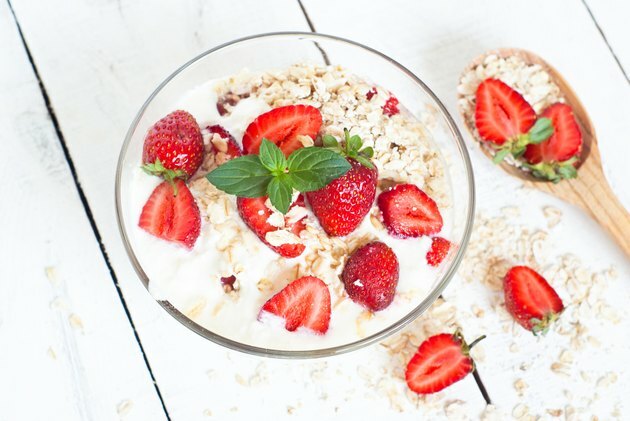 While Greek yogurt has no special weight loss powers, as a higher source of satiating protein than regular yogurt, the Mediterranean-style yogurt may be a better choice for those on a weight-loss diet. If you're trying to drop a few pounds, consider working Greek yogurt to your diet. When weight loss is your goal, use nonfat Greek yogurt to get the most benefits without the extra calories. A 6-ounce container of plain, nonfat Greek yogurt has 100 calories, 17 grams of protein and 6 grams of carbs. While plain, nonfat regular yogurt has fewer calories, it is higher in carbs and lower in protein. The same serving of regular yogurt has 95 calories, 10 grams of protein and 13 grams of carbs. Although plain, nonfat Greek yogurt is a little higher in calories than the regular nonfat yogurt, you might gain more benefits from its higher protein content when you're trying to lose weight than merely saving those 5 calories. Getting a higher percentage of your calories from protein -- as much as 30 percent -- according to a 2015 study published in Food Science and Nutrition, offers a number of benefits when it comes to weight loss, including better hunger control, preservation of muscle mass and an increase in your calorie-burning power. In addition, an increase in dairy foods, such as Greek yogurt, are also associated with weight loss. A 2005 study published in the International Journal of Obesity investigated the effects of a calorie-reduced diet with and without yogurt on weight loss in a group of obese people. The researchers found that the yogurt-eating group lost more weight than the non-yogurt eating group. However, it's important to note that the yogurt used in the study was regular nonfat yogurt, not Greek yogurt. Clinical studies using the higher-protein yogurt are necessary before claims can be made. The study also included regular exercise, which is an important aspect of any weight loss program. In addition to protein, there's also a significant difference in calcium content between Greek and regular yogurt. This is an important distinction, because it is also thought that the calcium in dairy foods may be partly responsible for the weight loss benefits of dairy foods. A 6-ounce container of plain nonfat Greek yogurt contains 110 milligrams of calcium, while the same serving of plain nonfat regular yogurt contains 338 milligrams. Even though it is lower in calcium than regular yogurt, Greek yogurt still fits well in a weight-loss diet. Just make sure you're getting enough other high-calcium foods -- such as milk, cheese or fortified foods -- to meet your daily calcium needs. For reference, adults need 1,000 milligrams to 1,200 milligrams of calcium a day. Greek yogurt makes a healthy addition to any weight-loss diet. It's filling, high in protein yet low in calories and a good source of calcium. Buy the plain variety and add fresh fruit to bump up the nutrition. The tangy yogurt also makes a healthy topper for your baked potato or you can use it to increase the protein content in a fruit smoothie. What's important to keep in mind when it comes to weight loss is your overall calorie intake. Even if all your calories come from healthy sources, such as nonfat Greek yogurt, eating more than your body needs will result in weight gain, not loss. What Is the Difference Between Activia and Regular Yogurt? Is Activia Yogurt a Good Weight-Loss Starter?